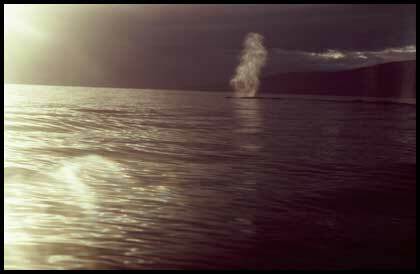 Guided by the light of a full moon, silence is broken by the calming meditative natural sounds of North Pacific Humpback whales breathing and singing as I kayak across the Auau Channel, which flows, between the Hawaiian islands of Maui and Lanai. 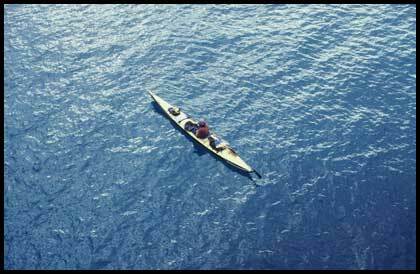 The Eskimo kayak once made from the skins of sea mammals was used by people of the north on their 1000-mile hunting treks in search of sea mammals. 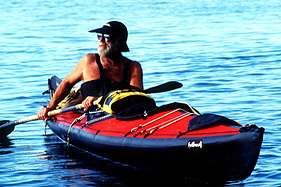 The kayak provided them with food, heat and clothing, a boat design with the reputation of being a true “Creature of the Sea”. A boat design that can whether most wind and sea conditions, a means of transportation in which I enter the sea as I would enter one’s home, peacefully and with respect, observing marine mammals that depend on sound to locate food, mates, and migration routes. (The sea – the world’s largest echo chamber where sound has 5 times the velocity as it does in our atmosphere. Within this echo chamber sea mammals such as whales, porpoise, dolphins, and seals are 20 times as sensitive to sound as we ourselves). I was introduced to the Eskimo Sea Kayak in the 1970’s upon sailing from my home of Maui, to Port Townsend, Washington, a quaint little seaport town on the Olympic Peninsula. I bought my first Eskimo sea kayak in Seattle. I was living in Lahaina in the 1970’s and worked on the beach at the newly built Kapalua Bay hotel. Without transportation I would paddle from Lahaina Yacht Harbor leaving at 2AM. After a 3-hour paddle I arrived at Kapalua Bay. 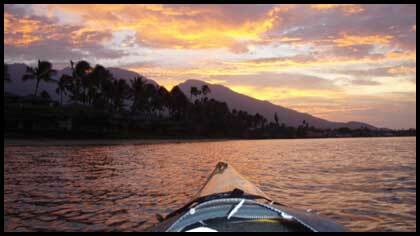 Camping out for several days I would then paddle back to Lahaina for several days off. I soon expanded my horizons, paddling to the outer islands of Lanai and Molokai, always crossing these open ocean channels at night when trade winds primarily back down. During the winter months (as if to guide my way) the presence of North Pacific Humpback whales would surface alongside. Due to these pilgrimages, and without reservations I approached the management of the Kapalua Bay hotel in interest of sharing my paddling experiences by presenting weekly lecture presentations. Spending much of my younger life living on a sailboat, I studied and observed sea life surrounding the Hawaiian Islands, reefs, currents, wind and sea conditions, and took pictures of my paddle ventures. 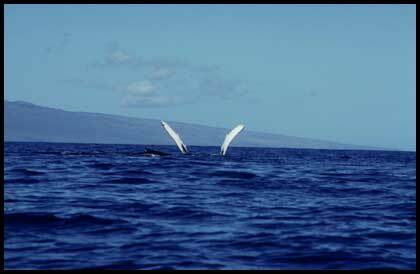 I received permission to read through diaries of whale men that visited Lahaina in the 1800’s, and studied the Hawaiian culture and beliefs pertaining to the sea. My weekly talks soon took interest in other hotels on Maui. Suddenly I was being paid as a speaker sharing my knowledge, experiences and observations all “From the Eyes of a Kayak”. As years passed I received interest from the late actor Mr. George Peppard who was a guest at the Kapalua Bay hotel. Mr. Peppard not only purchased my 18’6” custom Expedition Sea Kayak but also a video camera, which I mounted on the deck to record my observations. Mr. Peppards interest was to produce a film of my life for National Geographic or the Discovery Channel. Unfortunately Mr. Peppard passed away before such an endeavor could be complete, however I have since produced two short films now used in my lecture presentations, one of which can be viewed on my website. Gaining exposure as a speaker has taken me to colleges, organizations and conventions from the shores of Maui, the U.S. mainland, to South Africa. On going here at home I have been presenting presentations for more than 20 years. I’ve circumnavigated Lanai, Molokai and Maui many times over the past decades, usually taking around 3 weeks. It’s my way of life “Slow Down – take a Look Around” – just as nature, live in the moment, live with the seasons. On the islands of Lanai and Molokai I set up campsites, where I buried extra supplies just incase I was held over due to extreme wind and sea conditions. Carrying up to 125 pounds of supplies, I am self-sufficient for several weeks. Kayak weight along with supplies and myself would equal to about 350 pounds. It is necessary to carry weight primarily due to wind and sea conditions. My longest trek took me 6 years before implementing. I thought about it and talked about it for several years, then one afternoon while sitting a Kimo’s restaurant in Lahaina I shared my thought with a friend who was a writer for the local newspaper. The following week “Richard Roshon is going to paddle the Alenuihaha Channel. Followed by many sleepless nights, I was now committed. 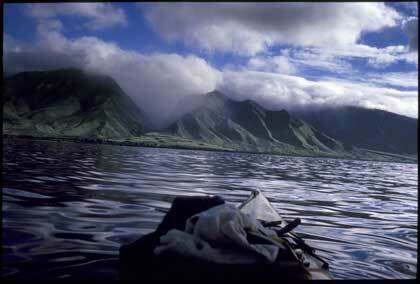 The Alenuihaha channel, approximately 40 miles wide can be one of the most extreme channels to cross. Wind and sea conditions traveling for thousands of miles are suddenly pinched between the islands of Maui and the big island of Hawaii where huge ocean ground swells can be and every day event. With 48 hours of Malia (calm) seas predicted, my good friend Nathan Kamisato drove me to the Kaupo Boat Ramp. 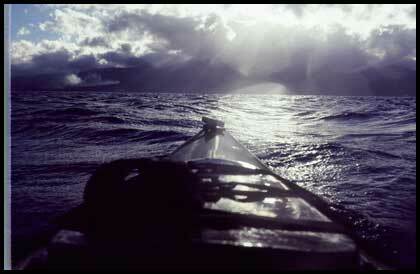 Once into the channel I encountered 15 to 20 foot ground swells, massive amounts of energy moving ever so quietly. Upon reaching the peaks of these massive ground swells I encountered gusts of wind produced by so much energy. I remember thinking of a song by Jimi Hendrix “It’s all in your mind”, and knew that I must go forward. 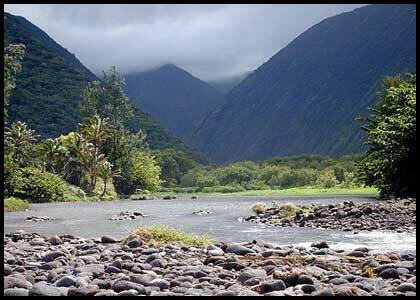 Nearly 20 hours later I entered Waipio Valley, on the island of Hawaii, one of the most beautiful places on earth. The sea kayak has been an extension of my life for more than 3 decades. It has allowed me to see this land of Hawaii perhaps with the same heartfelt feelings as the first Polynesians centuries past after there extended periods at sea in their doubled hulled canoes. 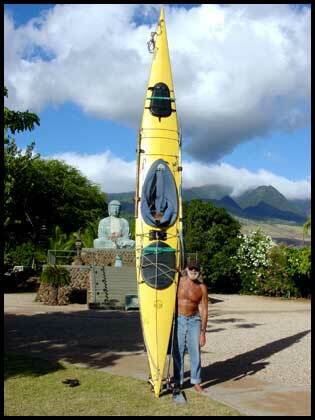 My Sea Kayak has also emphasized the true value and importance of all life, one breath, one stroke at a time. Over the years I’ve spent up to 10 days and nights eating and sleeping from my sea kayak, while body and mind enter a peaceful realm, a meditative state of mind, a place that can only be found in silence and in the complete presence with nature, creating a slower heartbeat, less food intake, and complete calmness within. I take only catnaps throughout this period while being completely aware of my surroundings such as changes in wind and sea conditions. 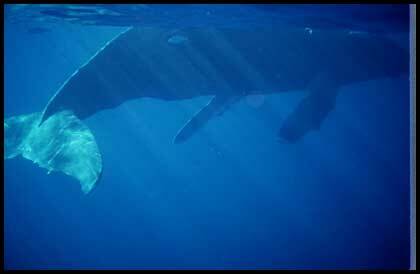 I am well rested and alert at all times, while North Pacific Humpback whales lie by my side, and I am humbled. Over the decades my experiences from viewing Green Sea Turtles mating, the approach of the Great White and Tiger sharks, to North Pacific Humpback whales have all been observed peacefully and with respect, “From the Eyes of a Kayak”. However my most memorable experiences are the numerous days and nights drifting in the Pailolo & Auau channels, eating and sleeping from my kayak while the sound of whales breathing and singing fill the atmosphere. Always spending these moments during the phrase of the full moon. In the light of the moon, they cross the bow of my kayak, expelling massive amounts of air into a misty plume, then like magic it disappears, all is silent as 40 tons descends into the darkness of the abyss. A mother lying on her back, with pectoral fins held high in the air; her calf swims over her belly as the mother then crosses her pectoral fins as if to caress her calf. However, it is a fact, all chapters in our lives must at sometime come to an end. After more than three decades, and over 30,000 logged miles of kayaking throughout the Hawaiian Archipelago I felt it was time to end the most heartfelt chapter of my life. At 68 years old I regretfully placed my Eskimo Sea Kayak up for sale. I knew that selling the Sea Kayak was going to be difficult, as over the decades I’ve only seen two Eskimo Sea Kayaks in these waters. One man was circumnavigating the entire Archipelago – which he did, and then there was Greg Gillette who in 1989 pulled into Kahului Harbor after a 63 day crossing from California to Maui. After many months of advertising I received a call from a serious buyer. As I lie in my hammock I was not sure I really wanted to say Aloha to this gifted way of life, as I knew there would be no more channel crossings, no more moments of silence with the sea and no more cherished memorable experiences with North Pacific Humpback whales. As I stood looking across the Auau channel towards the island of Lanai, I told myself, “ one more crossing”. I left Mala Wharf, Lahaina at 1AM and never looked back until I reached the fringing reef of Lanai around 5AM. Spending several days on Lanai, I enjoyed silence through meditation, walking, listening to the sea and to myself from within. I left my campground of more than 30 years at midnight under a full moon. Once across the fringing reef I fell into a meditative state of mind, all was silent as my paddle breaks the surface of this velvet carpet of the sea. With closed eyes, one breath, and one stroke at a time, I headed for home. Half way across the channel, I stopped. Starry eyed I sat in silence, reliving the quiet moments and experiences of so many decades, never thinking this chapter of my life would someday come to an end. Then something happened of which I cannot fully explain. A spiritual moment? Another dimension? And out of body experience? The sea and universe became one. I found myself drifting amongst the stars of the universe upon this velvet carpet of the sea. 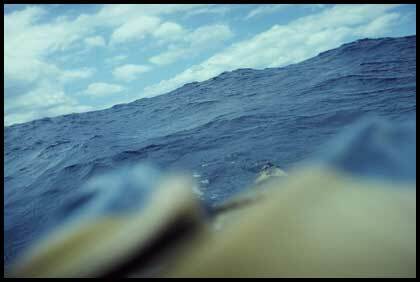 Unaware, I drifted for many hours for when I awoke the sun had been up for sometime and the Molokai current had taken me far north – I was drifting for the open seas. I sat without thought - Light-headed, and feeling such an incredible peace within, I took a deep breath, and one stroke at a time made my turn and headed for home. (Since then I often wonder – if this experience would have taken place during the migration of North Pacific Humpback whales, surrounded by the peaceful sounds of their singing and breathing - would I have kept on drifting towards the open seas? A place where I feel so at peace). Several hours later I paddled onto the beach directly in front of the Japanese Jodo Mission in Lahaina. 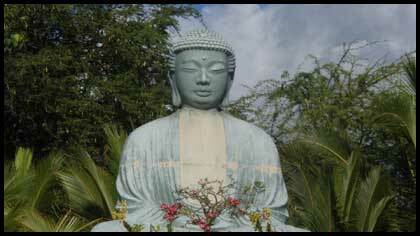 As my bow touched the sandy beach, the statue of the Buddha sat looking at me. Another deep breath, the end of a wonderful life experience, the end of a chapter - I am humbled and so blessed. My future will now focus on my deepest passion of sharing my life through speaking engagements, and the selling of my self-published book. In 2012 I completed my 30-year endeavor of my self-published book that tells my story, a volume of experiences, thoughts, wisdom and knowledge pertaining to Hawaii, the sea, and those that have traveled across this world’s velvet carpet. I am proud to say I’ve sold over 500 books in the first year, all books been personally signed. More information pertaining to my self-published book and availability of speaking engagements can be found on my website.